One summer day, a little girl finds a piece of rope under a tree. Her family uses the rope to tie luggage to the top of the car when they move to New York City. They had joined the Great Migration, when millions of African American families moved north, seeking better opportunities. The rope ties family events together as it is retrieved periodically to serve as a jump rope, to pull toys, to hang flowers and to serve as a clothes line even as it is passed down, tying the generations together. 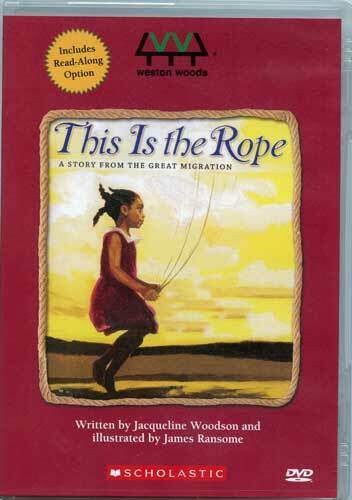 Woodson uses the metaphor of the rope to illustrate how families are bound together through a shared history. The images are fresh, rich in color and economically composed, with judicious choice of visual elements. The figures are fully realized, in correct proportion and in proper perspective, making for a satisfying visual experience. The narration is paced well for easy comprehension and supports the visual experience without overwhelming it with extraneous sound. The music is well matched to the theme and the visuals, adding to the viewing experience. The nine-minute DVD offers bonus features that include a Common Core Connection Activities section and read-along subtitles for closed-captioning enabled TVs. This DVD could be used in a story circle or an adult-led discussion of how children can discover their own family history and deal with the natural cycles of life.